Yesterday I ran, not just for myself, but for another mama and for her lost little one. 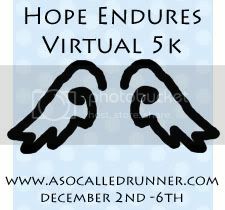 I went out right after the sun came up and ran for A So-Called Runner's Hope Endures Virtual 5K. While I was running I thought about my girls and how I could have just as easily been the one that people were running for. 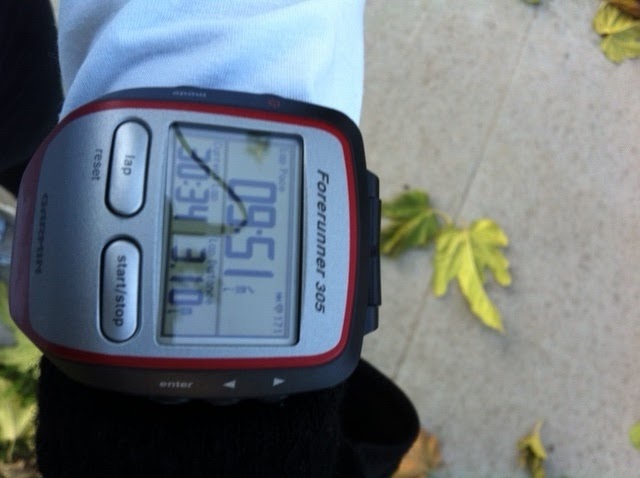 I put my heart into my run for Courtney and Ashlyn. I had a pretty good time, I felt great, it was cold (just above freezing) and I was bundled up. I ended up with a 30:34, which was a 9:51 pace, not my best, but a good pace and I felt great knowing that I was out running to remember a sweet angel. I only got a picture of my Garmin, which for some reason appears sideways when I post it to the blog, but not in my file (I'm having some major issues lately, I think I'm the problem, not the computer!). I didn't take a picture of myself because I was so cold that I jumped in a scalding hot shower the second I walked in the door. If you have time to run for Courtney and Ashlyn in the next couple of days get out there and do it! Thank you so much for running for me and Ashlyn, means so so much to me! It sounds like you had a good run and I think that time is good! Great job getting out there and running the 5k - I did mine this morning. Sometimes my camera/computer does the same thing - if I load the pic onto my computer and then rotate it so that it looks sidesways and then rotate it back and save it, it will show up normally then. Wierd, I know, but maybe you should try it!